2007. This is the recording debut of a female multi-instrumentalist new to the ambient & experimental music scenes. Previewed on Alchemy of Fingers and Dark, a budget-priced single, this full-length album Extended Gestures For Cello features 10 tracks of beautiful-yet-edgy solo cello ambience. As indicated by the album's title, these recordings are entirely made up of solo cello, performed live in studio by Lena, with electronic treatments and production by Hypnos founder and ambient experimentalist M. Griffin. The resultant sound is somewhere between recognizably cello-like traditional playing, and an edgier, more atmospheric, and more challenging tone. Extended Gestures For Cello plays at the fringes of deep drone minimalism, delves into electronically processed and multi-layered experimentalism, and yet will appeal to those fans of ambient sounds based on traditional musicality and instrumentation. At times, Lena's work sounds like chamber music in deep fog, and at others like an overheard argument between aliens. It is is uncompromising from start to finish. "Some great new albums from Hypnos this month. I'm so glad to see them releasing wonderful ambient music again.... But the big hit is the new album from Lena, a talented cellist and the new wife of Hypnos founder Mike Griffin. Her album is cello treated with electronics. Very deep and dark. It really explores the depths of the cello." "As an artist new to the recording scene, calling yourself simply "Lena" is certainly one way to make sure you don´t stand out in the crowd. I believe there are already a handful of Lenas on the record store shelves; I myself am currently working on a review of the third album by another Lena, the nom-de-reggae of French-Canadian sound artist Mathias Delplanque. However much she - and this Lena is indeed a she - hides the light of her personality under a bushel, Lena could not be more forthcoming in calling her album Extended Gestures for Cello. For that is exactly what it is - a whopping seventy minutes delving into cello sonorities. A "gesture" is generally understood as a simple, physical movement meant to convey a rather straightforward thought, and over ten tracks ranging from one to almost fifteen minutes, Lena coaxes many exquisite ideas out of her overgrown fiddle while her husband, ambient stalwart M. Griffin, paints a slightly out of focus background with subtle electronic treatments. I particularly like the sense of enormous indoor space they create on "Crowdmurmurs, Peopletalk". The longest track "Workings of Silver Fortunetellilng Machines" is a masterpiece of patience, as Lena strokes the cello once with her bow, allows the note to sound, carry, get caught up in the discreet electrical storm surrounding it in space, and diminish before taking another swipe at the instrument. Probably one of the most meticulously created and intellectually enjoyable ambient tracks I´ve heard this year. Not every single one of these "gestures" succeeds, but if Lena continues to carve out a career as ambient cellist, it will be interesting to see where her skill and imagination take her." 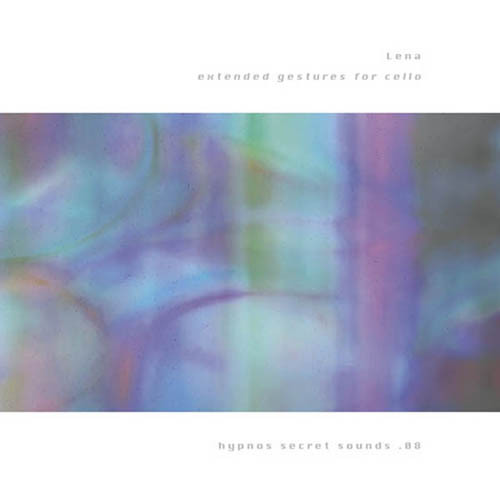 "Lena - Extended Gestures for Cello (finally picked this up, and am glad I did. Parts of it remind me of the bowed metal music of Harry Bertoia. Nicely done, Lena!)"